Fiji (Fijian: Viti; Fiji Hindi: फ़िजी), officially the Republic of Fiji (Fijian: Matanitu Tugalala o Viti; Fiji Hindi: रिपब्लिक ऑफ फीजी Ripablik ăph Phījī), is an island country in Melanesia in the South Pacific Ocean about 1,100 nautical miles (2,000 km; 1,300 mi) northeast of New Zealand's North Island. Its closest neighbours are Vanuatu to the west, New Caledonia to the southwest, New Zealand's Kermadec Islands to the southeast, Tonga to the east, the Samoas and France's Wallis and Futuna to the northeast, and Tuvalu to the north. The country comprises an archipelago of more than 332 islands, of which 110 are permanently inhabited, and more than 500 islets, amounting to a total land area of about . The farthest island is Onu-i-Lau. The two major islands, Viti Levu and Vanua Levu, account for 87% of the population of almost 860,000. 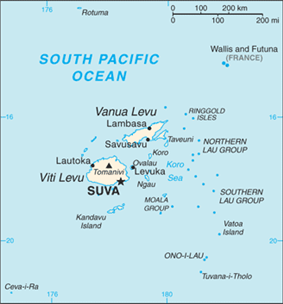 The capital and largest city, Suva, is on Viti Levu. About three-quarters of Fijians live on Viti Levu's coasts, either in Suva or in smaller urban centres like Nadi (tourism) or Lautoka (sugar cane industry). Viti Levu's interior is sparsely inhabited due to its terrain. 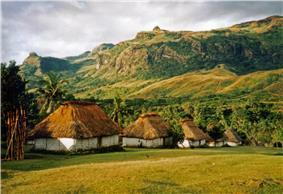 The first settlements in Fiji were started by voyaging traders and settlers from the west about 5000 years ago. Lapita pottery shards have been found at numerous excavations around the country. 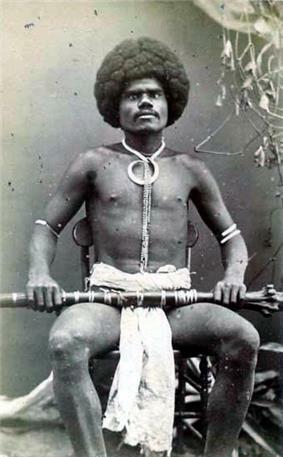 Aspects of Fijian culture are similar to the Melanesian culture of the western Pacific but have a stronger connection to the older Polynesian cultures. Trade between these three nations long before European contact is quite obvious with canoes made from native Fijian trees found in Tonga and Tongan words being part of the language of the Lau group of islands. Pots made in Fiji have been found in Samoa and even the Marquesas Islands. The British granted Fiji independence in 1970. Democratic rule was interrupted by two military coups in 1987 precipitated by a growing perception that the government was dominated by the Indo-Fijian (Indian) community. The second 1987 coup saw both the Fijian monarchy and the Governor General replaced by a non-executive president and the name of the country changed from Dominion of Fiji to Republic of Fiji and then in 1997 to Republic of the Fiji Islands. The two coups and the accompanying civil unrest contributed to heavy Indo-Fijian emigration; the resulting population loss resulted in economic difficulties but ensured that Melanesians became the majority. The year 2000 brought along Mahendra Chaudhry, who in 1997 had become the country's first Indo-Fijian prime minister following the adoption of the new constitution. Commodore Frank Bainimarama assumed executive power after the resignation, possibly forced, of president Ratu Sir Kamisese Mara. Later in 2000, Fiji was rocked by two mutinies when rebel soldiers went on a rampage at Suva's Queen Elizabeth Barracks. The High Court ordered the reinstatement of the constitution, and in September 2001, to restore democracy, a general election was held which was won by interim prime minister Laisenia Qarase's Soqosoqo Duavata ni Lewenivanua party. In 2005, the Qarase government amid much controversy proposed a Reconciliation and Unity Commission with power to recommend compensation for victims of the 2000 coup and amnesty for its perpetrators. However, the military, especially the nation's top military commander, Frank Bainimarama, strongly opposed this bill. Bainimarama agreed with detractors who said that to grant amnesty to supporters of the present government who had played a role in the violent coup was a sham. His attack on the legislation, which continued unremittingly throughout May and into June and July, further strained his already tense relationship with the government. In late November and early December 2006, Bainimarama was instrumental in the 2006 Fijian coup d'état. Bainimarama handed down a list of demands to Qarase after a bill was put forward to parliament, part of which would have offered pardons to participants in the 2000 coup attempt. He gave Qarase an ultimatum date of 4 December to accede to these demands or to resign from his post. Qarase adamantly refused either to concede or resign, and on 5 December the president, Ratu Josefa Iloilo, was said to have signed a legal order dissolving the parliament after meeting with Bainimarama. Citing corruption in the government, Commodore Josaia Voreqe (Frank) Bainimarama, Commander of the Republic of Fiji Military Forces, staged a military takeover on 5 December 2006 against the prime minister that he had installed after the 2000 coup. There had been two military coups in 1987 and one in 2000. The commodore took over the powers of the presidency and dissolved the parliament, paving the way for the military to continue the takeover. The coup was the culmination of weeks of speculation following conflict between the elected prime minister, Laisenia Qarase, and Commodore Bainimarama. Bainimarama had repeatedly issued demands and deadlines to the prime minister. At particular issue was previously pending legislation to pardon those involved in the 2000 coup. Bainimarama named Jona Senilagakali as caretaker prime minister. The next week Bainimarama said he would ask the Great Council of Chiefs to restore executive powers to the president, Ratu Josefa Iloilo. On 14 March 2014, the Commonwealth Ministerial Action Group voted to change Fiji's full suspension from the Commonwealth of Nations to a suspension from the councils of the Commonwealth, allowing them to participate in a number of Commonwealth activities, including the 2014 Commonwealth Games. The suspension was lifted in September 2014. 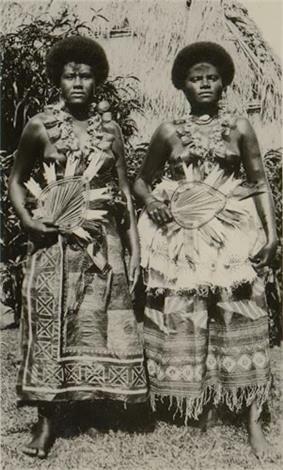 Within Fiji, the term Fijian refers solely to indigenous Fijians: it denotes an ethnicity, not a nationality. Constitutionally, citizens of Fiji are referred to as "Fiji Islanders" though the term Fiji Nationals is used for official purposes. In August 2008, shortly before the proposed People's Charter for Change, Peace and Progress was due to be released to the public, it was announced that it recommended a change in the name of Fiji's citizens. If the proposal were adopted, all citizens of Fiji, whatever their ethnicity, would be called "Fijians". 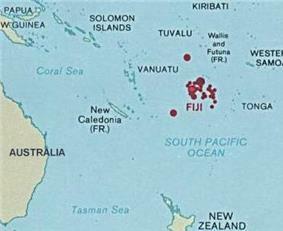 The proposal would change the English name of indigenous Fijians from "Fijians" to itaukei, the Fijian language endonym for indigenous Fijians. In May 2010, Attorney-General Aiyaz Saiyed Khaiyum reiterated that the term "Fijian" should apply to all Fiji nationals, but the statement was again met with protest. A spokesperson for the Viti Landowners and Resource Owners Association claimed that even fourth-generation descendants of migrants did not fully understand "what it takes to be a Fijian", and added that the term refers to a legal standing, since legislation affords specific rights to "Fijians" (meaning, in legislation, indigenous Fijians). Fiji academic Brij Lal, although a prominent critic of the Bainimarama government, said he "would not be surprised" if the new definition of the word "Fijian" were included in the government's projected new Constitution, and that he personally saw "no reason the term Fijian should not apply to everyone from Fiji". According to the 1996 census, among indigenous Fijians, 40% are Christian. 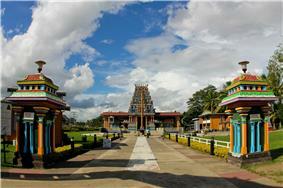 Among Indo-Fijians, most are Hindu or Muslim, while only a small minority are Christian. The breakdown per the CIA World Factbook is: Christian 64.5% (Methodist 34.6%, Roman Catholic 9.1%, Assembly of God 5.7%, Seventh-day Adventist 3.9%, Anglican 0.8%, other 10.4%), Hindu 27.9%, Muslim 6.3%, Sikh 0.3%, other or unspecified 0.3%, none 0.7% (2007 census). The largest Christian denomination is the Methodist Church of Fiji and Rotuma. (The general secretary is Revd Tuikilakila Waqairatu.) With 36.2% of the population (including almost two-thirds of ethnic Fijians), the proportion of the population adhering to Methodism is higher in Fiji than in any other nation. In 2012, permission was granted by the government for Methodists to hold their annual conference, for the first time in four years, with the conditions that the conference not coincide with the national Hibiscus Festival and should only last for three days, and that no political matters were to be discussed, only church matters. Roman Catholics (8.9%), the Assemblies of God (4%), the Seventh-day Adventists (2.9%) and The Church of Jesus Christ of Latter-day Saints (LDS Church) (2.2%) are significant. Fiji also is the base for the Anglican Diocese of Polynesia (part of the Anglican Church in Aotearoa, New Zealand and Polynesia). These and other denominations have small numbers of Indo-Fijian members; Christians of all kinds comprise 6.1% of the Indo-Fijian population. Much major Roman Catholic missionary activity was conducted through the Vicariate Apostolic of Fiji, which has since been renamed the Metropolitan Archdiocese of Suva, which spans the whole of Fiji. Hindus belong mostly to the Sanatan sect (74.3% of all Hindus) or else are unspecified (22%). The small Arya Samaj sect claims the membership of some 3.7% of Hindus in Fiji. Muslims are mostly Sunni (96.4%) following the Hanafi school of jurisprudence, with a small Ahmadiyya minority (3.6%). The Sikh religion comprises 0.9% of the Indo-Fijian population, or 0.4% of the national population in Fiji. Their ancestors originated from the Punjab region of India; they are a fairly recent wave of immigrants who did not live through the indenture system. The Bahá'í Faith has over 21 local Spiritual Assemblies throughout Fiji, and Baha'is live in more than 80 localities. The first Baha'i in the islands was a New Zealander who arrived in 1924. There is also a small Jewish population. Every year the Israeli Embassy organises a Passover celebration with about 100 people attending. 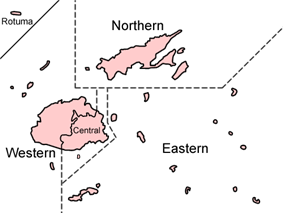 Central Division had 5 provinces: Naitasiri, Namosi, Rewa, Serua, and Tailevu. Fiji consists of 322 islands(of which 106 are inhabited) and 522 smaller islets. The two most important islands are Viti Levu and Vanua Levu, which account for about three-quarters of the total land area of the country. The islands are mountainous, with peaks up to 1,324 metres (4,341 ft), and covered with thick tropical forests. The highest point is Mount Tomanivi on Viti Levu. Viti Levu hosts the capital city of Suva, and is home to nearly three-quarters of the population. Other important towns include Nadi (the location of the international airport), and Lautoka, Fiji's second city with large sugar cane mills and a seaport. The main towns on Vanua Levu are Labasa and Savusavu. Other islands and islandgroups include Taveuni and Kadavu (the third and fourth largest islandsrespectively), the Mamanuca Group (just off Nadi) and Yasawa Group, which are popular tourist destinations, the Lomaiviti Group, off Suva, and the remote Lau Group. 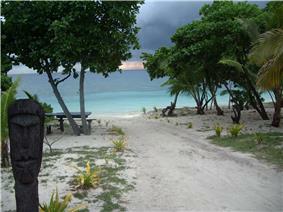 Rotuma, some 270 nautical miles (500 km; 310 mi) north of the archipelago, has a special administrative status in Fiji. 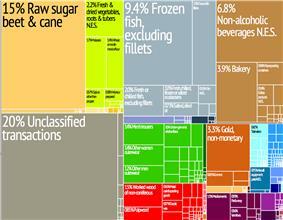 Graphical depiction of Fiji's product exports in 28 color-coded categories. Economic liberalisation in the years following the coup created a boom in the garment industry and a steady growth rate despite growing uncertainty regarding land tenure in the sugar industry. The expiration of leases for sugar cane farmers (along with reduced farm and factory efficiency) has led to a decline in sugar production despite subsidies for sugar provided by the EU; Fiji has been the second largest beneficiary of sugar subsidies after Mauritius. Fiji has a significant amount of tourism with the popular regions being Nadi, the Coral Coast, Denarau Island, and Mamanuca Islands. The biggest sources of international visitors by country are Australia, New Zealand and the USA. Fiji has a significant number of soft coral reefs, and scuba diving is a common tourist activity. Fiji's attraction is primarily its white sandy beaches and postcard perfect islands with all-year-round tropical weather. 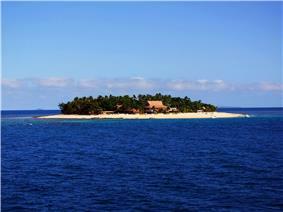 In general Fiji is a mid-range priced holiday/vacation destination with most of the accommodations in this range. It also has a variety of world class 5-star resorts and hotels. More budget resorts are being opened in remote areas, which will provide more tourism opportunities. Official statistics show that in 2012, 75% of visitors stated that they came for a holiday/vacation. A Fiji honeymoon is very popular as are romantic getaways in general. There are also family friendly resorts having facilities for young children including kids' clubs and nanny options. Fiji has several popular tourism destinations. The Botanical Gardens of Thursten in Suva, Sigatoka Sand Dunes, and Colo-I-Suva Forest Park are three options on the mainland (Viti Levu). 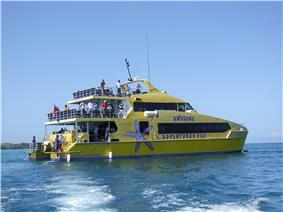 A big attraction on the outer islands is scuba diving. Fijian is an Austronesian language of the Malayo-Polynesian family spoken in Fiji. It has 350,000 first-language speakers, which is less than half the population of Fiji, but another 200,000 speak it as a second language. The 1997 Constitution established Fijian as an official language of Fiji, along with English and Fiji Hindi, and there has been discussion about establishing it as the "national language", though English and Hindustani would remain official. Fijian is a VOS language. The Fiji Islands developed many languages, some similar and some very different. Missionaries in the 1840s chose the language of one island off the southeast coast of the main island of Viti Levu to be the official language of Fiji. 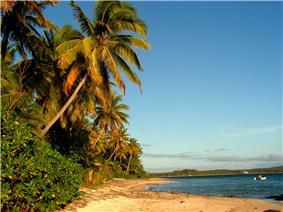 This island, Bau, was home to Cakobau, the chief that eventually became the self-proclaimed King of Fiji. Missionaries were interested in documenting a language and in uniting all of Fiji around one official language to make their job of translating and teaching in Fiji easier. Standard Fijian is based on the language of Bau, which is an East Fijian language. There are many other dialects that make up the West Fijian languages including all dialects spoken in the Nadroga/Navosa and those of the western island groups and provinces. Rugby Union is the most-popular team sport played in Fiji. The national rugby union team is very successful given the size of the population of the country, and has competed at five Rugby World Cup competitions, the first being in 1987, where they reached the quarter-finals. The Fiji national side did not match that feat again until the 2007 Rugby World Cup when they upset Wales 38–34 to progress to the quarter-finals where they nearly beat the eventual Rugby World Cup winners, South Africa. Fiji also defeated the British and Irish Lions in 1977. Fiji competes in the Pacific Tri-Nations and the IRB Pacific Nations Cup. The sport is governed by the Fiji Rugby Union which is a member of the Pacific Islands Rugby Alliance, and contributes to the Pacific Islanders rugby union team. At the club level there are the Colonial Cup and Pacific Rugby Cup. The Fiji sevens team is one of the most successful rugby sevens teams in the world, having won two world cup titles and the 2006 IRB Series. The Fiji national rugby union team is a member of the Pacific Islands Rugby Alliance (PIRA) formerly along with Samoa and Tonga. In 2009, Samoa announced their departure from the Pacific Islands Rugby Alliance, leaving just Fiji and Tonga in the union. Fiji is currently ranked eleventh in the world by the IRB (as of 28 March 2014). 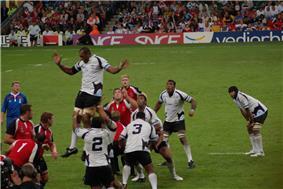 Fiji is one of the few countries where rugby union is the main sport. There are about 80,000 registered players from a total population of around 950,000. One of the problems for Fiji is simply getting their players to play for their home country, as many have contracts in Europe or with Super Rugby teams, where monetary compensation is far more rewarding. The repatriated salaries of its overseas stars have become an important part of some local economies. In addition, a significant number of players eligible to play for Fiji end up representing Australia or New Zealand; notable examples are Fiji-born cousins and current New Zealand All Blacks, Joe Rokocoko and Sitiveni Sivivatu and as well as Australian Wallabies Winger, Lote Tuqiri. Fiji has won the most Pacific Tri-Nations Championships of the three participating teams. The Fiji national rugby league team, nicknamed the Bati (pronounced [mˈbatʃi]), represents Fiji in the sport of rugby league football and has been participating in international competition since 1992. It has competed in the Rugby League World Cup on three occasions, with their best result coming when they made the semi-finals of the 2008 Rugby League World Cup. The team also competes in the Pacific Cup. Members of the team are selected from a domestic Fijian competition, as well as from competitions held in New Zealand and Australia. For the 2000 and 2008 World Cups, the Bati were captained by Lote Tuqiri and Wes Naiqama respectively. They have produced legendary players like Petero Civoniceva, Akuila Uate, Lote Tuqiri, Jarryd Hayne, Wes and Kevin Naiqama, Peni Tagive and Sisa Waqa. The Fiji Football Association is a member of the Oceania Football Confederation. The national football team defeated New Zealand 2–0 in the 2008 OFC Nations Cup, on their way to a joint-record third placed finish. However, they have never reached a FIFA World Cup to date. Fiji won the Pacific Games football tournament in 1991 and 2003. ^ "Section 4 of Fiji Constitution". www.servat.unibe.ch. Retrieved 3 May 2009. ^ "Annual official estimate" (PDF). 2008 revision. United Nations. 2012. Retrieved 31 May 2013. ^ a b c d "Fiji". International Monetary Fund. Retrieved 18 April 2012. ^ "FJST – Fiji Summer Time". www.timeanddate.com. Retrieved 24 October 2012. ^ In February 2011, the Prime Minister's Office issued a statement saying that the name of the state had been officially changed to the Republic of Fiji, and that the name written in the 1997 constitution was now void (constitution is suspended since April 2009). See Fijivillage.com (3 February 2011). "Country is now officially called Republic of Fiji". Retrieved 4 February 2011. ^ "CIA World Factbook – Fiji – Economy". ^ "Fiji – Our Government". www.fiji.gov.fj. 9 November 2009. Retrieved 15 September 2010. ^ "Fiji Geography". fijidiscovery.com. 2005. Retrieved 15 September 2010. ^ a b Perry, Nick; Pita, Ligaiula (29 September 2014). "Int'l monitors endorse Fiji election as credible". AP. Retrieved 25 September 2014. ^ Schutz, Albert J. (December 1974). "The Forerunners of the Fijian Dictionary". The Journal of the Polynesian Society 83 (4): 443–457. ^ Barbour, Thomas (1923). "The Frogs of the Fiji Islands". Proceedings of the Academy of Natural Sciences of Philadelphia 75: 111–115. ^ Scarr, Deryck (1984). Fiji: A short history. Institute for Polynesian Studies, Brigham Young University—Hawaii Campus. ^ Sanday, Peggy Reeves (1986) Divine hunger: cannibalism as a cultural system, Cambridge University Press, p. 151, IBNS 0521311144. ^ Pacific Peoples, Melanesia/Micronesia/Polynesia at the Wayback Machine (archived March 1, 2005), Central Queensland University. ^ “Historical Time line”. Fiji government. ^ “World Battlefronts: Yanks in the Cannibal Isles”. TIME. 26 October 1942. ^ Phil Taylor (6 December 2006). "Fiji – alone under the gun". NZ Herald. Retrieved 30 September 2007. ^ "Commander hands back executive authority to Ratu Iloilo". FijiVillage.com. 4 January 2007. Archived from the original on 30 September 2007. ^ "I support army takeover: Iloilo". Fijilive. 4 January 2007. Archived from the original on 30 September 2007. ^ "President swears in interim PM". Fijilive. 5 January 2007. Archived from the original on 30 September 2007. ^ President's Address to the Nation at the Wayback Machine (archived August 18, 2009), fiji.gov.fj (10 April 2009). ^ "Chair of Pacific Islands Forum says Fiji has been suspended". ^ "Fiji suspended from the Commonwealth". Commonwealth.org. 1 September 2009. Retrieved 2 May 2010. ^ Home. Police.gov.fj. Retrieved on 5 May 2013. ^ Fiji Corrections Service. Corrections.org.fj. Retrieved on 5 May 2013. ^ "Dealing with the dictator". The Australian (Sydney). 16 April 2009. ^ Minority Rights Groups International. "Fiji Islands Overview". Retrieved 3 September 2009. ^ Charter proposes common Fijian name at the Wayback Machine (archived August 17, 2008), Fiji Live (4 August 2008). ^ "Communalism is ‘to love thy neighbour'", Fiji Times (29 August 2008). ^ PM Bainimarama – Address to the nation following appointment of Cabinet at the Wayback Machine (archived April 18, 2009), fiji.gov.fj (11 April 2009). ^ "All Fiji nationals to be known as Fijians, says AG". ^ "Bainimarama hits back at critics". ^ "Decree on term Fijian could be imminent". ^ a b "Graceful trees mark anniversary". Baha'i World News Service. 12 April 2005. Retrieved 9 December 2006. ^ Fiji Government Online Portal: Our Country. Retrieved 26 April 2010. ^ Zealand, New (19 August 2008). "Democracy hopes dashed after Fiji pulls out of Pacific Forum". Abc.net.au. Retrieved 3 May 2009. ^ "Public holidays clarified". Ministry of Information, Fiji. 22 March 2010. Retrieved 2 August 2012. ^ Arrivals information at the Wayback Machine (archived January 6, 2007). Fiji Islands Bureau of Statistics. ^ a b c d Fiji Travel Information and Travel Guide. Lonely Planet. Retrieved April 2010. ^ Fiji Bureau of Statistics. Statsfiji.gov.fj. Retrieved on 18 July 2013. ^ Airports Fiji Limited – Outer Islands. 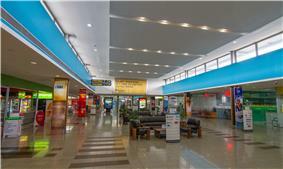 Airportsfiji.com. Retrieved on 5 May 2013. ^ Gibson, Nevil (May 14, 2012). "Air Pacific reverts to original Fiji Airways name". ^ Land Transport Authority – "Steering Fiji Safely". Ltafiji.com. Retrieved on 5 May 2013. ^ Taxi drivers told to be fair. Fbc.com.fj (7 October 2012). Retrieved on 5 May 2013. ^ Fijian Language. Fiji-faqs.com. Retrieved on 5 May 2013. Wright, Ronald (1986). On Fiji Islands. Original from the Traces the colonisation of the Fiji Islands, explains how the Fijians have managed to keep their language and culture intact, and describes modern Fiji society. Lal, Brij V. (1992). Broken Waves: A History of the Fiji Islands in the Twentieth Century. 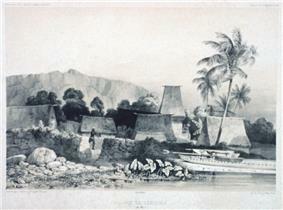 Details of Fiji's History, Geography, Economy. Miller, Korina; Jones, Robyn; Pinheiro, Leonardo (2003). Fiji. Lonely Planet. Scarr, Deryck (1984). Fiji: A Short History. Sydney, Australia: Allen & Unwin. Waterhouse, Joseph (1998). The King and People of Fiji. University of Hawaii Press.